It can't be said too often . . . Update! Update! Update! If your web site is little more than a business card displaying only your church address and phone number, then updates won't be necessary. But, if your web site is a dynamic reflection of your vibrant, on-the-move congregation, then it must be updated weekly. My Web Management service can keep your web site current with weekly updates, content changes and enhancements. 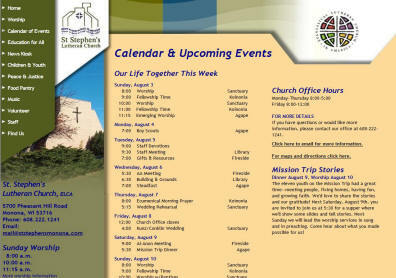 Occasionally, you will have need for a new page to inform your members and visitors about a special event. With my service, you will be able to add pages quickly and easily.